The distribution of the secondary metabolites in different tissues of Panax notoginseng has not yet been investigated. Furthermore, there is no scientific evidence available for the quality assessment of P. notoginseng. This is the first study on the tissue-specific chemicals to identify and determinate the main secondary metabolite profiling of P. notoginseng in order to provide more information for quality evaluation. 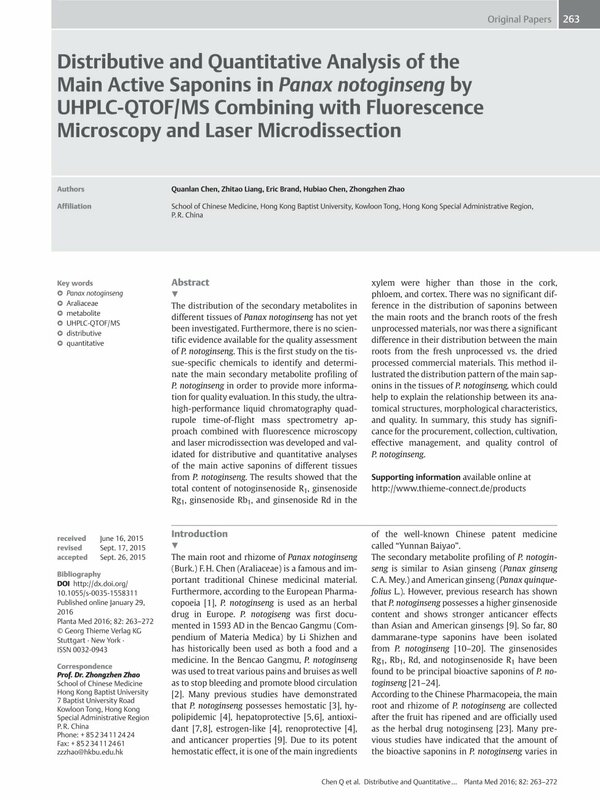 In this study, the ultrahigh-performance liquid chromatography quadrupole time-of-flight mass spectrometry approach combined with fluorescence microscopy and laser microdissection was developed and validated for distributive and quantitative analyses of the main active saponins of different tissues from P. notoginseng. The results showed that the total content of notoginsenoside R1, ginsenoside Rg1, ginsenoside Rb1, and ginsenoside Rd in the xylem were higher than those in the cork, phloem, and cortex. There was no significant difference in the distribution of saponins between the main roots and the branch roots of the fresh unprocessed materials, nor was there a significant difference in their distribution between the main roots from the fresh unprocessed vs. the dried processed commercial materials. This method illustrated the distribution pattern of the main saponins in the tissues of P. notoginseng, which could help to explain the relationship between its anatomical structures, morphological characteristics, and quality. In summary, this study has significance for the procurement, collection, cultivation, effective management, and quality control of P. notoginseng.